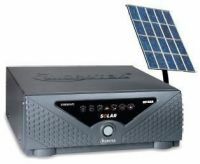 Microtek solar inverter msun 935 VA off grid Microtek MSUN 935 VA is a off grid solar inverter which is designed to give power using solar panel. It is a starting model in microtek solar inverters with 30 amps chargers which supports a panel connectivity of 600 Wp. To Recieve updates and possible rewards for Microtek M-SUN SOLAR UPS 935VA please sign in. To Recieve updates and possible rewards for UPS & Inverter please sign in.